Here are two pics of homeowner-installed range / dryer receptacles. The dryer recep is obviously dangling...think of an MC extension cord. The range recep is also simply sitting on the floor, but in this case the romex is not secured to the case either. Once again, little more than a fancy extension cord. In both cases, these properties were built in the days when a 30-amp service was common, and a 60-amp was for the rich folks. As you might have guessed, the original wiring was completely inadequate for today's lifestyles, and much more was required than just a "service change". Was that range receptacle ever secured to something? 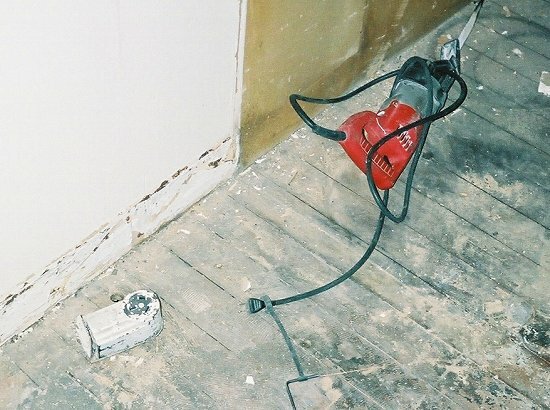 It's not too clear in the photo, but if the Romex comes up through the floorboards where I think it does, it looks as though it's too far from the wall for the receptacle to have ever been properly mounted. Or was there a very thick baseboard there once where the marks are on the wall? 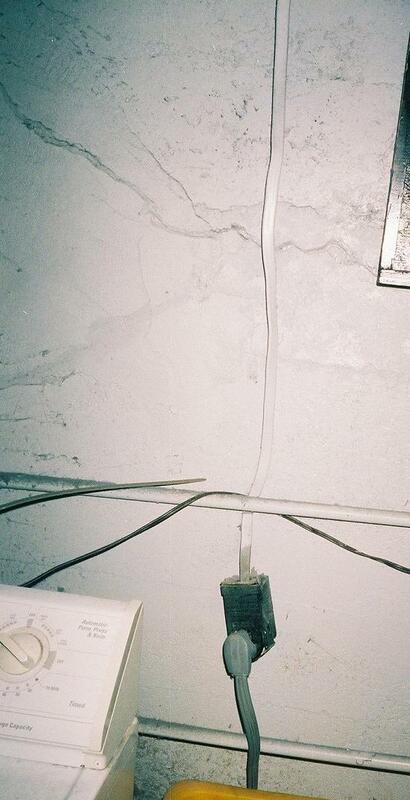 By the way, what's that lying just on top of the plug/cord to the eletric saw? Paul, that's a rubber attachment that holds the allen wrench for the blade set screw. Ah... I can see it now, thanks. Couldn't quite make out what it was before. The receptacle has a metal backing plate; the cord can enter from either the bottom or the back. In either case, this metal piece should be anchored to the wall, and a strain-relief clamp should be used. In this install, the cable (romex) was fed through a hole in the floor, into the receptacle without any strain relief. Nor was the plate anchored in any way. This could have been a legal install....no reason not to mount it to the floor....but no effort was made to do it correctly. I'm cheap enough that I haven't upgraded to the new Sawzall with tooless blade changes. Call me old-fashioned if you like, but I often prefer the traditional fixings. I had two Makita jigsaws, 110 and 240V versions, one with "Quick change" the other without, but the same model in all other respects. I found the blades easier to change on the old-style clamp with hex wrench than on the one with its "Quick-Change" mechanism on the top. In the bottom pic, next to the Range recept, is that a hole in the floor?. Makes me wonder if the guy tried to drill down through there and struck a nice big floor joist. Judging by the top pic, there is a bit of movement going on with the walls. Can't say I'm a great fan of that Romex going in behind that pipe either. Is that cable feeding the recept the right size?, it looks thinner than the cord on the dryer. Yes, there is an earlier attempt at a hole near the range receptacle. The foundation of the house did require considerable shoring to one side of the kitchen. As to the dryer, well, I goofed here- that is romex, not MC. It actually was large enough; I think the apparent difference in sizes is simply due to the different constructions of the cables. I wondered about them 2 cables and the difference in size. What type of cable is that on the dryer?. It looks outlandishly thick, mind you I have no idea what sort of current a dryer draws in the US. Is the recept actually fixed to the wall?.